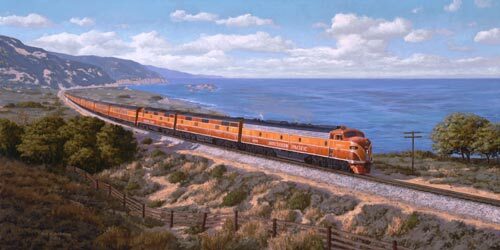 Home / CRUISING THE PAST / Southern Pacific’s COAST DAYLIGHT was America’s most beautiful train! 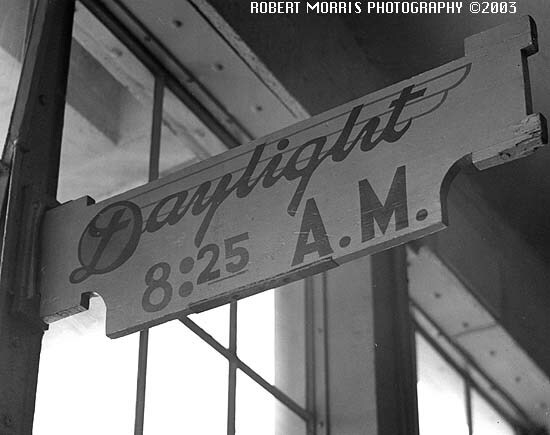 The Coast Daylight had its inaugural run on March 1, 1937 between Los Angeles and San Francisco. It was hauled by GS-2 steam locomotives. It was the first of the Daylight series that also included the San Joaquin Daylight, Shasta Daylight, Sacramento Daylight, and Sunbeam. The Coast Daylight ran behind steam from March 1937 until it was dieselized on January 7, 1955. After dieselization, the train continued to run until May 1, 1971 when Amtrak took over service and rerouted their Coast Daylight to Oakland. First Class Parlor Car Travel aboard the Southern Pacific’s COAST DAYLIGHT – when the passengers dressed to kill. 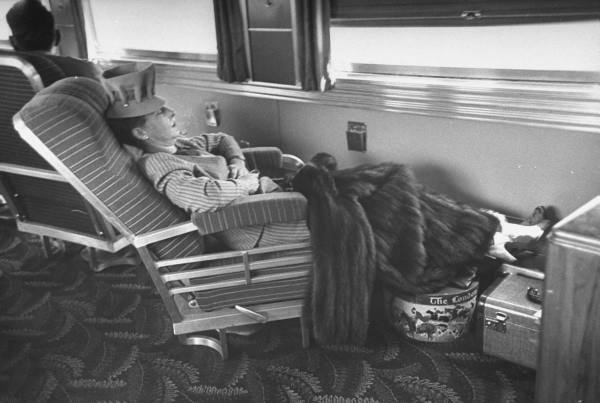 Woman in Parlor Car during the late 1940s – going from San Francisco to Los Angeles. A total image of the past. A second train known as the Noon Daylight ran on the same route between 1940 and 1949, with a suspension during World War II. The original Coast Daylight was informally known as the Morning Daylight during this time. 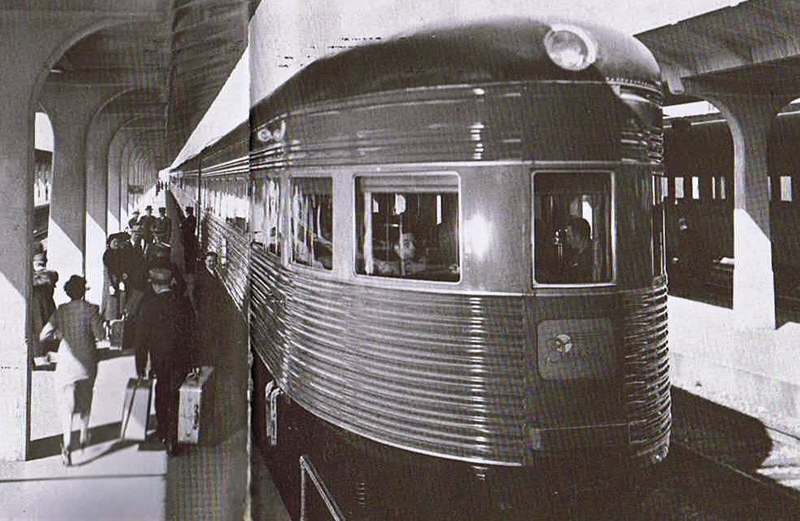 In 1949, the Noon Daylight was replaced by an overnight train known as the Starlight using the same equipment. In 1956, coaches from the Starlight were added to the all-Pullman Lark and the Starlight was discontinued in 1957. Amtrak later revived the train name for its Los Angeles to Seattle service known as the Coast Starlight. On August 26, 1999: The United States Postal Service issued 33-cent All Aboard! 20th Century American Trains commemorative stamps featuring five celebrated American passenger trains from the 1930s and 1940s. One of the five stamps featured an image of a GS-4 steam locomotive pulling the red-and-orange train along the California Pacific Coast. 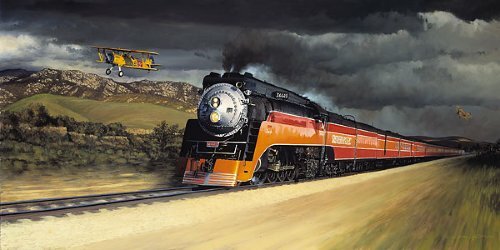 Southern Pacific’s DAYLIGHT – The “Most Beautiful Train in the World”! 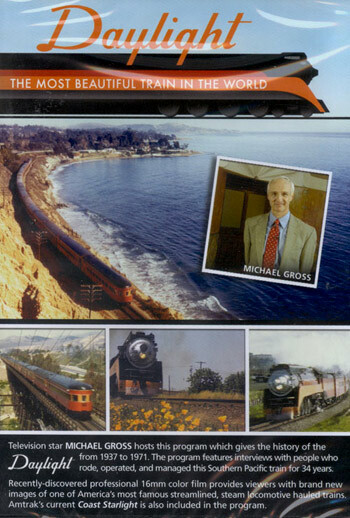 The train is also the subject of the railroad documentary, “Daylight: The Most Beautiful Train in the World.” hosted by Michael Gross. The documentary features early color images and color films from within the train and as it travels along its route. Passengers fondly reminisce about their travels aboard the train, about the striking coastal scenery, and about the fine amenities available at the height of rail passenger era. The narrative is accompanied by large collection of contemporaneous photographs and films, including personal black-and-white films showing life aboard the train. The documentary covers the time period from 1937 to 1971. This is the time period when the route and equipment were owned and operated as a business venture of the Southern Pacific Railroad. It begins with the train being ordered in 1935 in spite of the ongoing depression, entering service in 1937, operating through World War II, replacing locomotives with diesel power in the 1950s, and finally the demise of the train due to the declining rail passenger traffic. 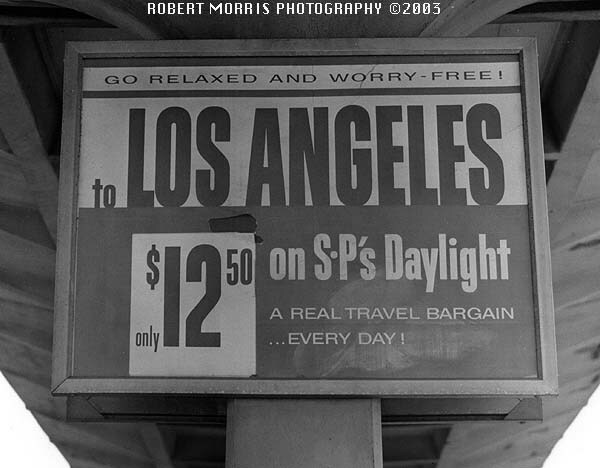 After World War II, declining revenues forced SP to cut costs through a series of austerity measures. One significant change was that the train’s layout was reconfigured to eliminate the dining cars. These were replaced in favor of Automat cars. The Automat cars offered prepared food from vending machines instead of fresh, made-to-order meals in the dining cars. These cars saved money by eliminating all of the train’s culinary personnel. This was a utilitarian configuration which allowed for seating, for baggage, and for the Automat car. This configuration was used until the train was discontinued. In 1971, Amtrak took over operation of the route along the Pacific coast, expanding the route northward to Portland and Seattle. In 2008 it was announced that the “Coast Daylight” will resume service, allowing a flexible passenger itinerary, in 2011. THE COAST DAYLIGHT – THE MOST BEAUTIFUL TRAIN IN THE WORLD – Southern Pacific’s famous streamliner between Los Angeles and San Francisco. Train Town Video Productions Presents a railroad video featuring Southern Pacific’s Daylight 1937-1957. Considered the most beautiful train in the world – covering some of the most spectacular scenery in America. The down home music in the video hardly represents this sophisticated train. It was anything but “country”! A chair car porter loads baggage aboard the Daylight in new elevated storage areas – a major innovation for passenger travel in the 1930s. The Daylight ready to depart from Los Angles Union Station during the 1940s. 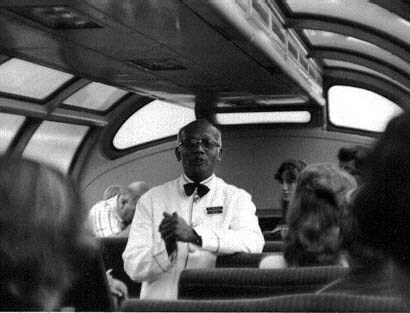 A dome car was added in the late 1950s. The train is also the subject of the railroad documentary, “Daylight: The Most Beautiful Train in the World.” hosted by Michael Gross. Click here to order the video. The documentary features early color images and color films from within the train and as it travels along its route. Passengers fondly reminisce about their travels aboard the train, about the striking coastal scenery, and about the fine amenities available at the height of rail passenger era. 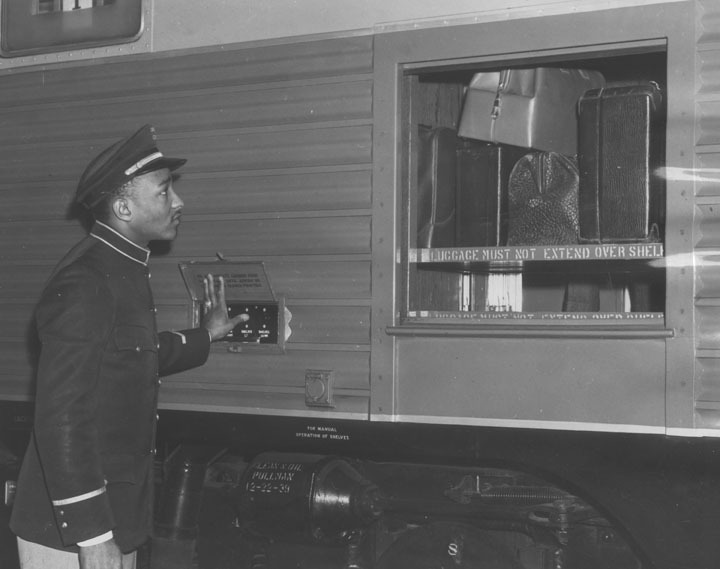 The narrative is accompanied by large collection of contemporaneous photographs and films, including personal black-and-white films showing life aboard the train. The documentary covers the time period from 1937 to 1971. This is the time period when the route and equipment were owned and operated as a business venture of the Southern Pacific Railroad. It begins with the train being ordered in 1935 in spite of the ongoing depression, entering service in 1937, operating through World War II, replacing locomotives with diesel power in the 1950s, and finally the demise of the train due to the declining rail passenger traffic. After World War II, declining revenues forced SP to cut costs through a series of austerity measures. 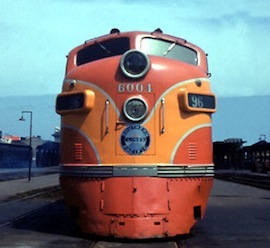 For complete information on the SP Daylight – and all of the Southern Pacific trains – check out the SOUTHERN PACIFIC HISTORICAL SOCIETY website by clicking her.